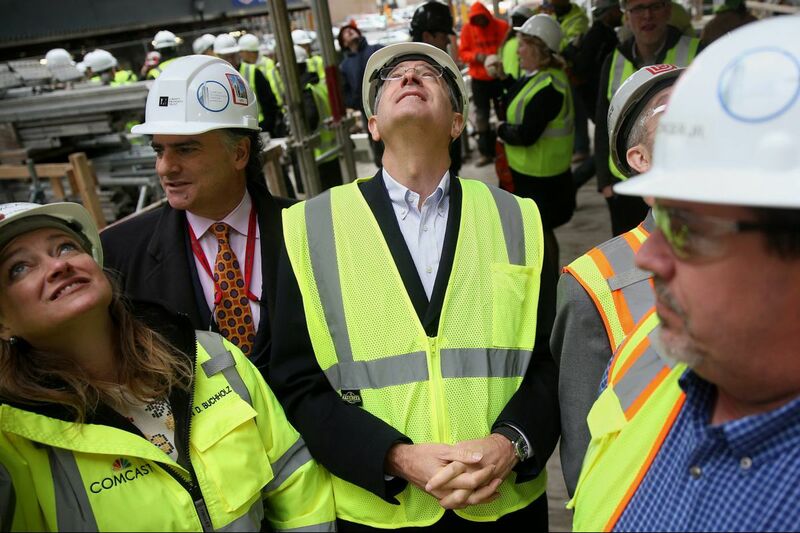 From left, Karen Buchholz, Comcast Corp., senior vice president of administration; John Gattuso, regional director and senior vice president of Liberty Property Trust, and Comcast CEO Brian Roberts watch as the final beam is raised at the new Comcast tower on Wednesday. "Send it, you salty dogs!" With that shout at 11:43 a.m. Wednesday, a crane operator hoisted the final steel beam, inked in black marker with the names of hundreds of construction workers for posterity's sake, to the top of the new Comcast Corp. tower. Comcast and Liberty Property Trust had lunch served for about 1,200 floor layers, glaziers, and other workers on the site at 19th and Arch Streets, a block from Comcast Center headquarters, as a thank-you for a job well done erecting what company officials say will be the tallest building in the United States outside Manhattan and Chicago. "There's a sense of magic that we're doing something special here," CEO Brian Roberts told the crowd of construction workers and officials gathered in an unfinished space that will become a ground-floor restaurant. Though there had been injuries at the site, there had been no workplace fatalities, a construction official said. The 60-story tower — now six years in the making — is costing $1.2 billion. The Comcast office space is expected to be available for thousands of workers beginning in June. A Four Seasons hotel that will top the building is expected to be finished in fall 2018. The final beam is raised at the Comcast Technology Center on Wednesday. The new Comcast Technology Center will house the company's engineers and product developers. It is designed with an open floor plan, without offices, and an underground concourse will connect the existing Comcast Center headquarters with the new building. Roberts broadly views the new tower as a cultural pivot for the Philadelphia company as it transitions from a cable firm that grew through relentless acquisitions over about 50 years to a technology company that competes with Silicon Valley titans like Apple and Google. Philadelphia chef Greg Vernick will run the as-yet-unnamed ground-floor restaurant. He created for the construction workers a menu of cider-braised short ribs with red fingerling potatoes and Kennett Square mushrooms. There also were salad and a gingerbread cake. Because Vernick did not have the kitchen capacity to serve more than 1,000 construction workers, the meal was prepared by Flik, the company that runs Ralph's, the Comcast cafeteria. Paul Tilelli, 55, a glazier from Cherry Hill, stood and listened to Roberts' remarks as he ate lunch. "We're used to doing this," Tilelli said, referring to the standing and eating. "But actually not eating this good." John Gattuso, regional director and senior vice president at Liberty Property Trust, which jointly owns the building with Comcast and is managing the construction, said that the highest beam was hoisted into place several weeks ago, and that this was the "last beam." Ironworkers had placed a small statue of Billy Penn on that highest beam to give the Eagles good luck. Attendees watch the holiday light show in the Comcast Center lobby on Wednesday. Separately Wednesday, during the noon viewing, Comcast took note of the two-millionth visitor to watch its Christmas video in the Comcast Center lobby. A crowd of a few hundred people was treated to a holiday musical performance by the Philly Pops and to Olympics-emblazoned wool hats and scarves. Comcast’s entertainment subsidiary, NBCUniversal, owns the U.S. television rights to the Winter and Summer Olympics.